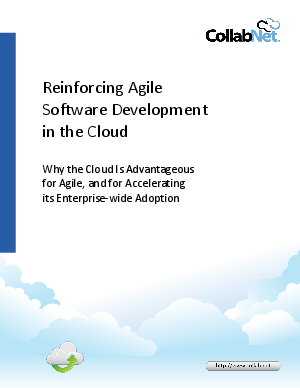 The popularity of Agile software development is growing as adoptees experience faster production, improved quality and, not least of all, a more flexible and collaborative process designed to accommodate change. In fact, Agile's effectiveness stems from collaboration-via multiple and faster feedback loops, transparent communications, and agreement that unanticipated issues will arise. So why not reinforce Agile's power by giving users access to it in an environment that fosters wide-spread use, and collaboration: The Cloud.